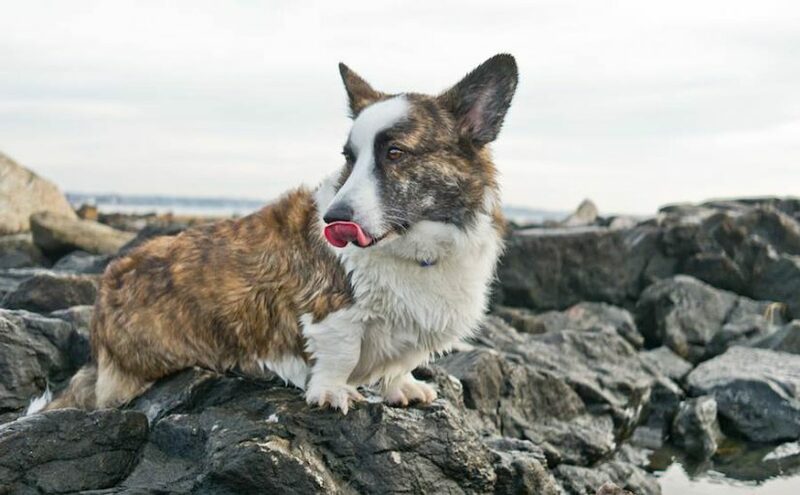 Cardigan Welsh Corgi originated in the hill country of Cardiganshire in western Wales. The time of origin is uncertain, but perhaps a thousand years ago. 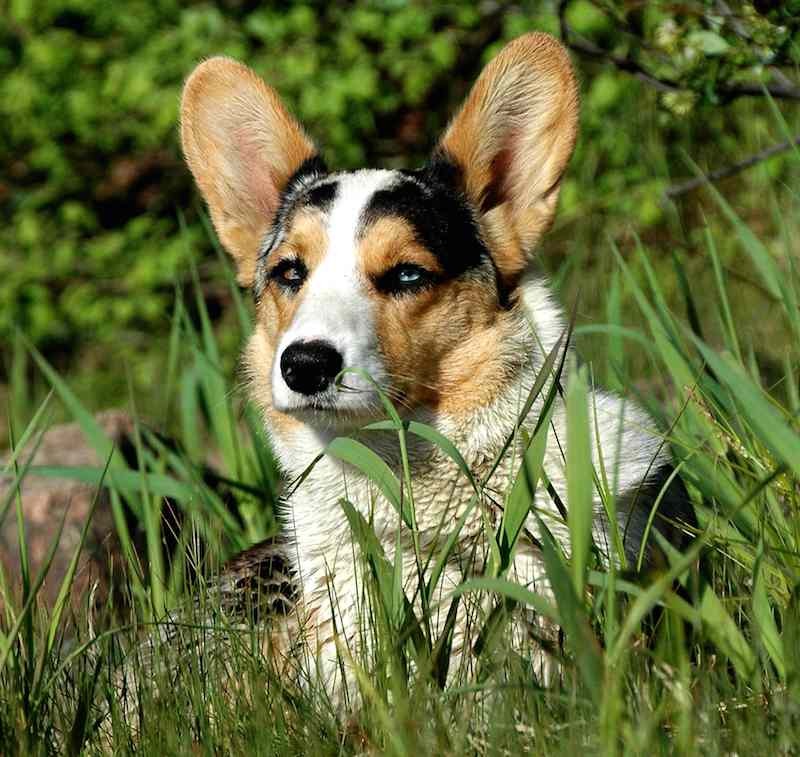 The Cardigan Welsh Corgi dog breed was originally a general-purpose farm dog, frequently used for driving cattle. General Appearance: Sturdy, mobile, and capable of endurance. Overall silhouette long in proportion to height, terminating in a fox-like brush, set in line with the body. Alert expression. 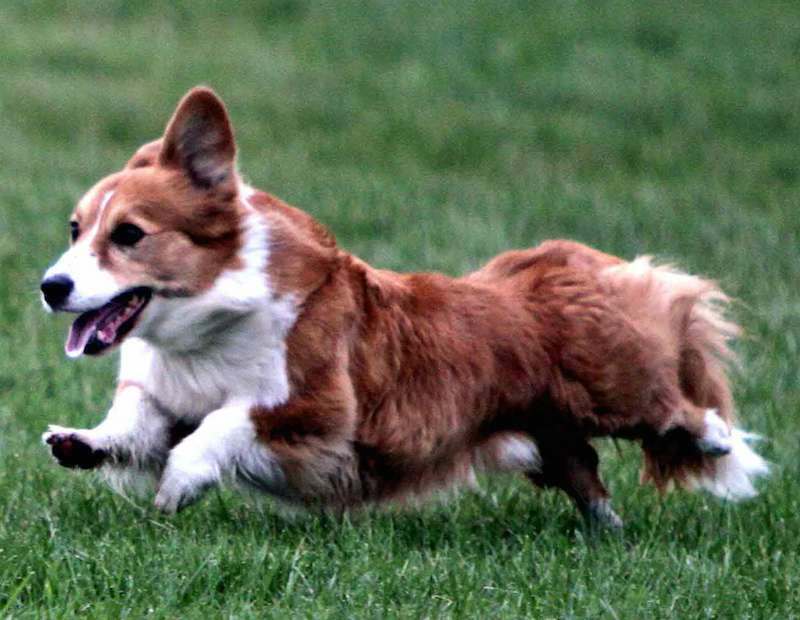 Cardigan Welsh Corgi Temperament: Alert, active, and intelligent, with steady temperament. Size: Height as near as possible to 12 inches (30 cm) at the shoulder. Weight in proportion to size, with overall balance as prime consideration. Coat: Short or medium of hard texture. Weatherproof with good undercoat. Preferably straight. Colour Any colour, with or without white markings, but white should not predominate. Head: Skull: Head foxy in shape and appearance, skull wide and flat between the ears, tapering towards the eyes, above which it should be slightly domed. Moderate amount of stop. Length of foreface in proportion to skull as 3 is to 5, tapering moderately towards the nose, which should be black, slightly projecting and in no sense blunt. Underjaw clean-cut, strong but without prominence. Eyes: Medium size, clear, giving a kindly, alert but watchful expression. Rather widely set with corners clearly defined. Eyes preferably dark, or to blend with the coat, rims dark. One or both eyes pale blue, blue or blue flecked, permissible only in blue merles. Ears: Erect, proportionately rather large to the size of the dog. Tips slightly rounded, moderately wide at the base and set about 3- 1/2 inches (9 cm) apart. Carried so that the tips are slightly wide of a straight line drawn from the tip of the nose through the centre of the eyes, and set well back so that they can be laid flat along the neck. Mouth: Teeth strong, with a perfect regular and complete scissors bite, i.e., the upper teeth closely overlapping the lower teeth and set square to the jaw. Pincer bite permissible. The teeth should be evenly arranged and not crowded in relation to one another. Neck: Muscular, well developed and in proportion to the dog’s build, fitting into well-sloped shoulders. Forequarters: Shoulders well laid and angulated at approximately 90 degrees to the upper arm; muscular, elbows close to sides. Strong bone carried down to feet. Legs short but body well clear of the ground, forearms slightly bowed to mould round the chest. Feet turned only slightly outwards. Body: Chest moderately broad with prominent breast bone. Body fairly long and strong with deep brisket, well-sprung ribs and clearly defined waist. Topline level. Hindquarters: Strong, well angulated and aligned, with muscular thighs and second thighs, strong bone carried down to feet, legs short; when standing, hocks should be vertical viewed from the side and rear. Feet Round, tight, rather large and well padded. All dewclaws should be removed. Tail: Like a fox’s brush set in line with the body and moderately long (to touch or nearly touch the ground). Carried low when standing but may be lifted a little above the body when moving, but not curled over the back. Gait: The gait should be free, smooth, and appear effortless. In forequarters, there should be good forward reach, without exaggerated lift, and with good follow-through. The elbows should work close to the body, neither loose nor tight. Viewed from in front, the forefeet should approach a single track at a brisk trot. In hindquarters there should be good forward reach and moderate rear extension, giving the appearance of a powerful driving action. The stifles must bend, giving appearance that the hocks are lifted, not swung from the hip. From the rear, tendency towards single tracking is preferred. At a trot, the topline should remain relatively level, without pronounced bobbing in front or rear.